Click here to see Guido's race pictures! Click here to see Guido's chauffeur! 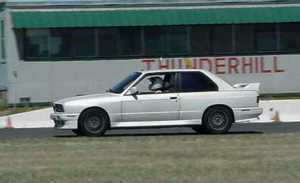 Presenting "Guido," a 1988 M3, in all his Infiniti Pearl White glory. The story of Guido's name, as I heard it: A previous owner desecrated this Cinnabar Red M3 with decidedly non-BMW-standard pearl white paint. When somebody quipped that the car looked like it should have pointy shoes and gold chains in its chest hair, the name Guido was bestowed. the roll cage, harness, and fire extinguisher installation. Wow, this is a different look! The yellow paint protects holes drilled for the cage. Jim Bassett supervised the cage install. Guido is officially a race car! We're ready to go racin'! Click here for racing pictures!